Biodegradable Sheet Protectors are made from acid-free polypropylene which contains an additional additive that allows it to biodegrade when tested according to the ASTM D5511. 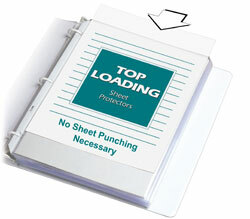 * Top loading design eliminates the need for hole punching. Acid-free polypropylene means print wont stick to sheet protectors. Standard weight. For 11 x 8 1/2 document storage in standard three-ring binders. 100/BX. * Learn about ASTM testing and the time and conditions it takes for these products to biodegrade..
Sheet Protector Special Features: Polypropylene, top-loading sheet protectors are made from acid-free polypropylene, which contains an additional additive.